I’m looking for recommendations on snow/winter tyres for my 118d. Tyre size is 225/45/17. I drive for a living so I can’t be staying at home just because it’s snowed. I couldn’t go anywhere when we had the bad snow earlier this year. Price is obviously important but performance in the snow is the key factor for me. 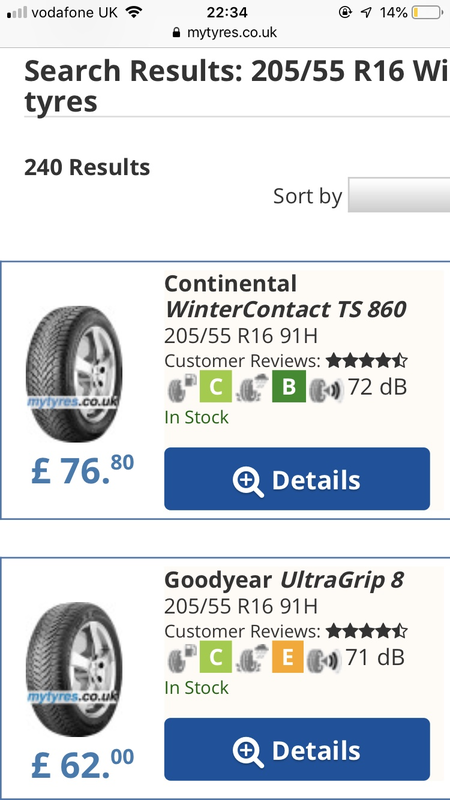 As it’s rear wheel drive do I only need them on the rear? I had a 4x4 prior to this so apologies if I sound stupid. chesterflaps wrote: I’m looking for recommendations on snow/winter tyres for my 118d. Tyre size is 225/45/17. You want them on all four wheels. Yea the rears get you moving but the front ones direct you. I’ve used Continental Winters - can’t remember the name and also the Avon I’ve tourers. Both sets were really good, got me moving in places where others were stuck. If you can get a second set of wheels it’ll be easier than mounting to your current rims - also cheaper in the long run. I believe that 16inch wheels will fit your car so I’d suggest 205/55/16 for the tyre size. 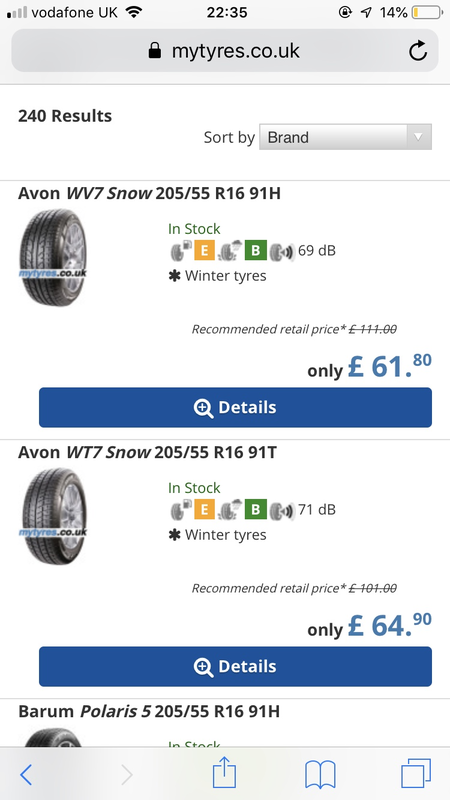 I did think about another set of wheels but in fairness I cover about 30k miles a year so by the time winter is over, I’ll be due a new set of tyres anyway. I’ll take a look at the ones you mentioned. Sorry but I’m assuming predictive text changed the name of the Avons. What did you mean to type? Thank you. Can’t seem to find them. On another note, if you’ve had different wheels for your winter tyres, how did pressure sensors work? If I put normal valves on, Will I get a constant warning light? This will be my first winter with the m140 with sensors on the wheels. My previous m135 and 120d both were fine as they didn’t have them fitted. . But yes. You’ll get a constant warning for low pressure unless you buy a separate set of sensors. I’ll have a search for Avon now. The continentals were winter contact model. That’s really kind of you, thanks. Looking at the conti vs the Avon, the fuel efficiency is better on the conti. 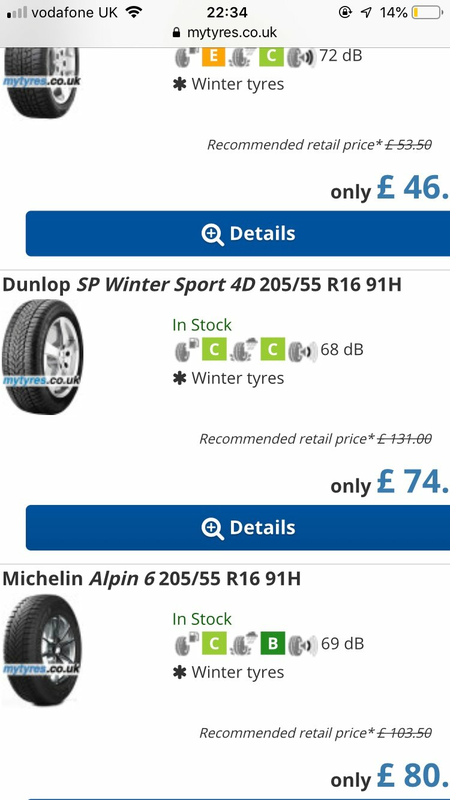 I do A LOT of miles so I reckon it’s worth an extra few quid on tyres for better fuel economy. If I remember rightly my continentals lasted 3 winters as well! Put them on when temps stay below 7-8’c and you’ll be fine. I do 30k+ on my E91 318d and run winter tyres all year round now, got bored of rusted wheel spignots and getting the mallet to them, no ill effects of running them all year (Riken Snowtimes 205/55/16 FYI common size so cheap) 20k on them so far, no visable wear at all and been great in the standing water. Others may hark at the sheer madness of running them all year, but we don't exactly live in the Mediterranean, and my mates who do live there (Italy in particular) run them all year also and it's a little bit warmer there ha! Interesting. Didn’t they feel soft and wear quicker during the summer? We regularly saw temps over 28’c. My car never feels as planted when on winters. They have saved my bacon a few times over the years (when I had my 118d I wore them all year round also) which meant I could get home to my family while others didnt, that's the reason in the end surely...but everyone can make there own judgement on whether they are worth it, I don't actually care haha! I will always use them either way. MontegoBlue wrote: I do 30k+ on my E91 318d and run winter tyres all year round now, got bored of rusted wheel spignots and getting the mallet to them, no ill effects of running them all year (Riken Snowtimes 205/55/16 FYI common size so cheap) 20k on them so far, no visable wear at all and been great in the standing water. I swear by mine in the winter for sure! Just wondered if you’d noticed more wear during the summer. It’s amazing popping past a 4x4 in some country lane that hasn’t seen life for a while when it snows heavy. Have used winter tyres for 5 years now. I have a spare set of wheel. Never regret changing over to winters, or changing back to summers. Satisfying to get the wheels properly clean. I do about 10000 miles a year and got 4 winters out of my first set. They still had quite a lot of tread but as discussed elsewhere here the usual is to swap out winters when they have about 5mm because they start with more tread depth than summer tyres. Having said that my tyre centre (who I really trust) said that it is not necessary to ditch them so early and that 3-4 mm is when they regard them as spent.